Aria Lepidoptera is a celebration of the beauty of light, space and architecture. 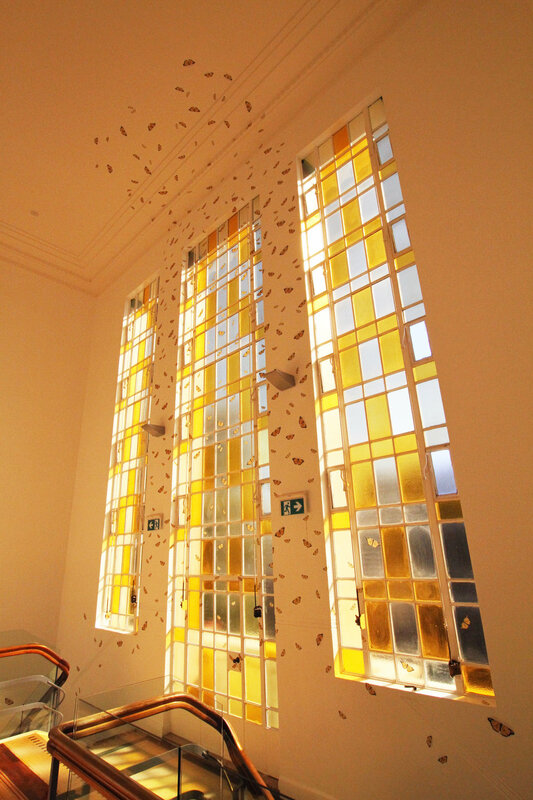 The 9m x 9m mural consists of hundreds of yellow paper butterflies pasted onto the glass panels of the art deco feature window and surrounding walls of the Courthouse Arts building in Geelong. As the viewer proceeds upstairs from the lower level entrance they come across first one, then two or three common yellow butterflies. However, as they continue their journey their attention is drawn upwards into the maelstrom of butterflies that appear to whirl out of the glass, upwards and out into the surrounding space. Aria Lepidoptera is a love song to beauty and creative risk. It is my gift to the city I grew up in.